Others believe that the name is related to the god of the nature, goats and shepherds Pan and/or pan, the Proto-Slavic/Proto-Indo-European word for lord/master, which could mean Pan's Land or Land of the Master(s), which is more probable due the fact the Ionian fleet supplied Pannonia via the Black Sea and Danube, and Panionium festivities were also well known in the region to its Celtic, Adriatic Veneti and Scythian inhabitants. Andronicus of Pannonia (Greek: Ἀνδρόνικος) was a 1st-century Christian mentioned by the Apostle Paul: Salute Andronicus and Junia, my kinsmen, and my fellow prisoners, who are of note among the apostles, who also were in Christ before me. According to that verse, Andronicus was a kinsman of Paul and a fellow prisoner at some time, particularly well-known among the apostles, and had become a follower of Jesus Christ before Paul's Damascus road conversion. It is generally assumed that Junia was his wife, but they could have been brother and sister, or father and daughter, or no close relation to each other, but to Paul as kinsmen. Brčko (Cyrillic: Брчко, pronounced [br̩̂tʃkoː]) is a town and the administrative seat of Brčko District. Located in northern Bosnia and Herzegovina, it lies on the banks of Sava river across from Croatia. As of 2013, it has a population of 83,516 inhabitants. It is the only existent entirely self-governing free city in Europe. Dalmatia was a Roman province. Its name is derived from the name of an Illyrian tribe called the Dalmatae, which lived in the central area of the eastern coast of the Adriatic Sea. It encompassed the northern part of present-day Albania, much of Croatia, Bosnia and Herzegovina, Montenegro, Kosovo and Serbia, thus covering an area significantly larger than the current Croatian region of Dalmatia. Originally this region was called Illyria (in Greek) or Illyricum (in Latin). The province of Illyricum was dissolved and replaced by two separate provinces: Dalmatia and Pannonia. The Devil's Dykes (Hungarian: Ördög árok), also known as the Csörsz árka ("Csörsz Ditch") or the Limes Sarmatiae (Latin for "Sarmatian border"), are several lines of Roman fortifications built mostly during the reign of Constantine I (312–337), stretching between today's Hungary, Romania and Serbia. The Duchy of Pannonian Croatia (Croatian: Kneževina Panonska Hrvatska) was a medieval duchy from the 7th to the 10th century located in the Pannonian Plain approximately between the rivers Drava and Sava in today's Croatia, but at times also considerably to the south of the Sava. Its capital was Sisak. Pannonia Film Studio (also known as MAFILM Pannónia Filmstúdió) is the largest animation studio in Hungary, based in the capital of Budapest. Pannonia Prima was an ancient Roman province. It was formed in the year 296, during the reign of Emperor Diocletian. Previously, it was a part of the province of Pannonia Superior, which, along with Pannonia Inferior, was gradually divided into four administrative units: Pannonia Prima, Pannonia Secunda, Valeria, and Savia. This transition was completed by the time of Constantine. According to the Notitia Dignitatum, Pannonia Prima was governed by a Praeses. Pannonia Savia or simply Savia, also known as Pannonia Ripariensis, was a Late Roman province. It was formed in the year 295, during the tetrarchy reform of Roman emperor Diocletian, and assigned to the civil diocese of Pannonia, which was attached in the fourth century to the Praetorian prefecture of Illyricum, and later to the Praetorian prefecture of Italy. The capital of the province was Siscia (today Sisak). Pannonia Savia included parts of present-day Croatia, Slovenia and Bosnia and Herzegovina. The Pannonia Secunda was one of the provinces of the Roman Empire. It was formed in the year 296, during the reign of emperor Diocletian. The capital of the province was Sirmium (today Sremska Mitrovica). Pannonia Secunda included parts of present-day Serbia, Croatia, and Bosnia and Herzegovina. Pannonia Superior, lit. Upper Pannonia, was a province of the Roman Empire. Its capital was Carnuntum. It was one on the border provinces on the Danube. It was formed in the year 103 AD by Emperor Trajan who divided the former province of Pannonia into two parts: Pannonia Superior and Pannonia Inferior. The province included parts of present-day states of Austria, Croatia, Hungary, Slovakia, and Slovenia. The Pannonia Valeria or simply Valeria, also known as Pannonia Ripensis, was one of the provinces of the Roman Empire. It was formed in the year 296, during the reign of emperor Diocletian, in a division of Pannonia Inferior. The capital of the province was Sopianae (today Pécs). Pannonia Valeria included parts of present-day Hungary and Croatia. The province continued as an entity under the rule of the Huns until the rise of the Kingdom of the Ostrogoths in the 5th century. It then became the central Avar realm then part of the Avar March, later grew into the Duchy of Pannonia and finally the Balaton Principality regaining Pannonia Secunda before being conquered by the Magyars. It is a geomorphological subsystem of the Alps-Himalaya system, specifically a sediment-filled back-arc basin. Most of the plain consists of the Great Hungarian Plain (in the south and east, including the Eastern Slovak Lowland) and the Little Hungarian Plain (in the northwest), divided by the Transdanubian Mountains. The Pannonian Basin lies in the southeastern part of Central Europe. It forms a topographically discrete unit set in the European landscape, surrounded by imposing geographic boundaries - the Carpathian Mountains and the Alps. 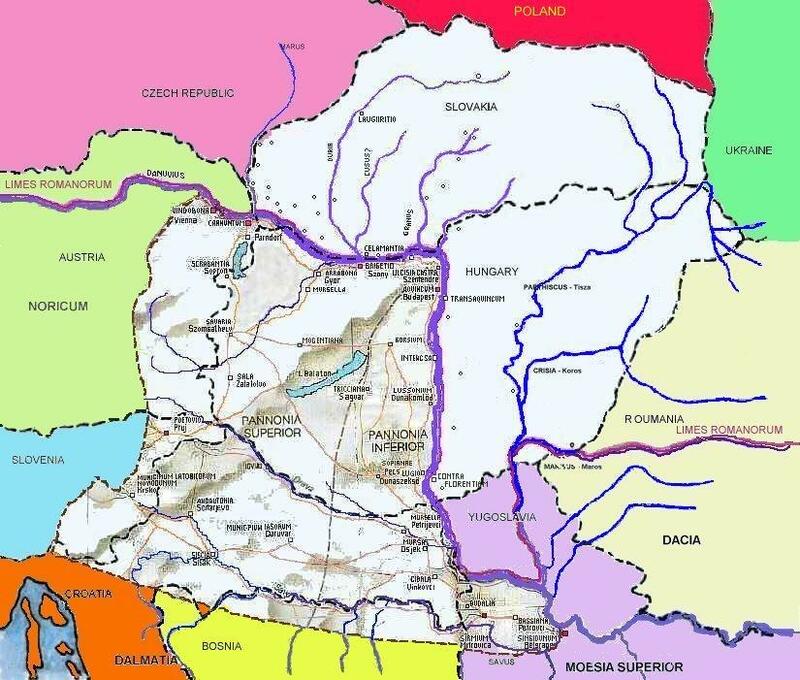 The Rivers Danube and Tisza divide the basin roughly in half. It extends roughly between Vienna in the northwest, Bratislava in the northeast, Ostrava in the north, Zagreb in the southwest, Novi Sad in the south and Satu Mare in the east. In terms of modern state boundaries, the basin centres on the territory of Hungary, but it also covers regions of western Slovakia (the Eastern Slovak Lowland), southeastern Poland, western Ukraine, western Romania, northern Serbia (Vojvodina), the tip of northeast Croatia (Slavonia), northeastern Slovenia, and eastern Austria. The name "Pannonian" comes from Pannonia, a province of the Roman Empire. Only the western part of the territory (the so-called Transdanubia) of modern Hungary formed part of the ancient Roman Province of Pannonia; this comprises less than 29% of modern Hungary, therefore Hungarian geographers avoid the terms "Pannonian Basin" and "Pannonian Plain". Rusyns in Pannonia, or simply Rusyns or Ruthenians (Rusyn: Руснаци or Русини, Serbo-Croatian: Rusini, Русини), are a regional minority subgroup of the Rusyns, an Eastern Slavic peoples. They are located in the Central European region of Pannonia, which today covers almost all of Hungary, the southern-most parts of Slovakia, northeast Croatia, a tiny sliver portion of northeast Slovenia, and the northern-most part of Serbia (Vojvodina). They are also considered to be related to the northern Carpathian Rusyns (Carpathian Ruthenians) who live in Carpathian Ruthenia (mostly in Ukraine and Slovakia, but also in Poland, Romania, Czech Republic and Hungary). Petrovaradin (Serbian Cyrillic: Петроварадин, pronounced [petroʋarǎdiːn]) is one of two city municipalities which constitute the city of Novi Sad. As of 2011, the urban area has 27,083 inhabitants, while the municipality has 33,865 people inhabitants. Lying across the river Danube from the main part of Novi Sad, it is built around the Petrovaradin Fortress, historical anchor of the modern city. Sirmium was a city in the Roman province of Pannonia. First mentioned in the 4th century BC and originally inhabited by Illyrians and Celts, it was conquered by the Romans in the 1st century BC and subsequently became the capital of the Roman province of Pannonia Inferior. In 294 AD, Sirmium was proclaimed one of four capitals of the Roman Empire. It was also the capital of the Praetorian prefecture of Illyricum and of Pannonia Secunda. Sirmium was located on the Sava river, on the site of modern Sremska Mitrovica in northern Serbia. The site is protected as an Archaeological Site of Exceptional Importance. The modern region of Syrmia (Srem) was named after the city. Sirmium had 100,000 inhabitants and was one of the largest cities of its time. Colin McEvedy, however, put the population at only 7,000, based on the size of the archaeological site. Ammianus Marcellinus called it "the glorious mother of cities". Vindobona (from Gaulish windo- "white" and bona "base/bottom") was a Roman military camp on the site of the modern city of Vienna in Austria. The settlement area took on a new name in the 13th century, being changed to Berghof, or now simply known as Alter Berghof (the Old Berghof).Around 15 BC, the kingdom of Noricum was included in the Roman Empire. 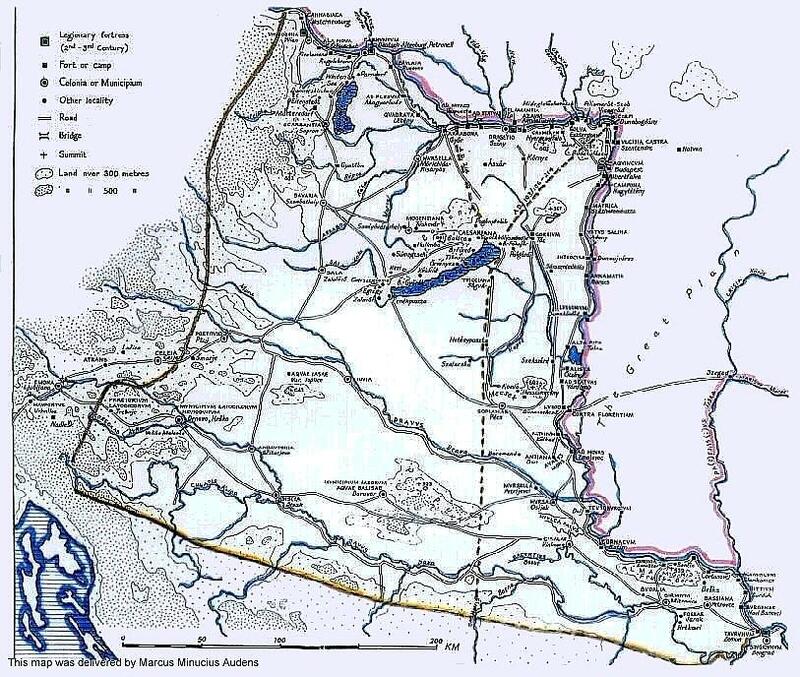 Henceforth, the Danube marked the border of the empire, and the Romans built fortifications and settlements on the banks of the Danube, including Vindobona with an estimated population of 15,000 to 20,000.